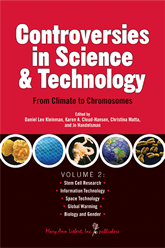 Controversies in Science and Technology Volume 2: From Climate to Chromosomes explores five of the most controversial scientific issues facing our world today. This collection of informative and engaging essays addresses stem cell research, information technology, space exploration, global warming, and biology and gender. These issues challenge our beliefs about each other, our planet, societal fairness, the concept of “knowing,” and the definition of human life itself.